Professionals who write about illness narratives often think of them in opposition to the medical narratives that define illness and disease from a clinical perspective. They believe that stories about illness, written by patients and others, break free from the “grand narratives” constructed by doctors and other health professionals, both now and across history. Certainly illness narratives bring a new voice to the discussion of ill health. Yet while they might well do something different from the narratives of doctors, they still have things in common with other kinds of storytelling. We had to walk down a long corridor, which had a shiny buffed floor that squeaked when walked on, and you felt sure that everyone would stare at you. However, we encountered very few people along the corridors with their shiny brown hued floors, and many doors, an antiseptic smell and tubular steel trolleys left abandoned at the side of the walkway. Joseph’s and Marie’s narratives show how we all use some of the archetypes of storytelling – the common elements of stories that we share – to describe something that is strange, confusing and unfamiliar. 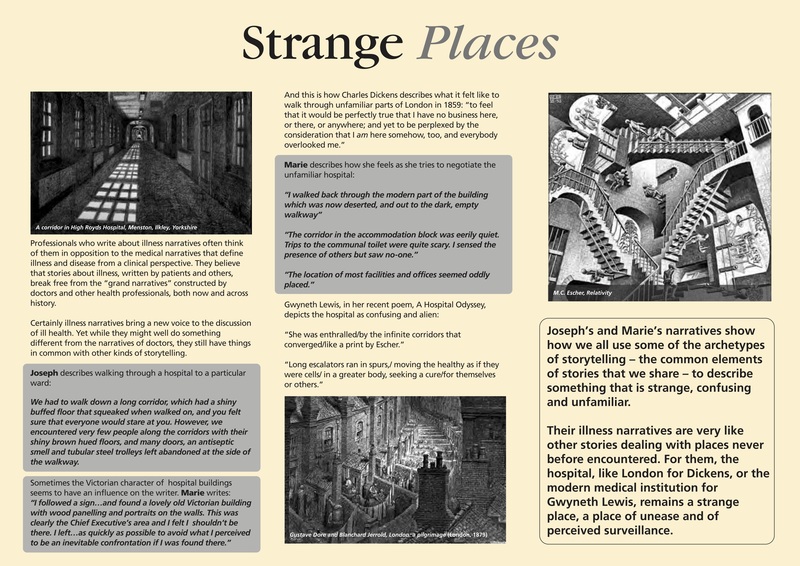 Their illness narratives are very like other stories dealing with places never before encountered. For them, the hospital, like London for Dickens, or the modern medical institution for Gwyneth Lewis, remains a strange place, a place of unease and of perceived surveillance.